The Temple of Zeus Ellanios located on top of Mount Ellanion, which is the highest mountain of Aegina. The temple is dedicated to Zeus who sent rain to the island after a long drought. The temple of the Olympian Zeus was the largest temple in Greece in the Hellenistic and Roman times. 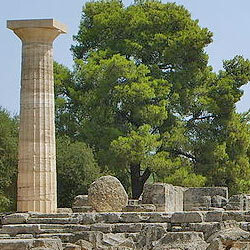 The temple was founded by Deucalion, the first ancestor of the Greeks, to honor Zeus who saved him from the flood. The temple of Olympian Zeus was completely made of Pentelic marble and throughout the temple there were statues and busts of famous men. The temple had a length of about 100 meters and a width of 40 meters. His famous columns, 104 in total, had a height of 17 meters and a diameter of 2.6 meters. Every single one of the columns had a weight of 364 tons.